I was afraid they’d do this. 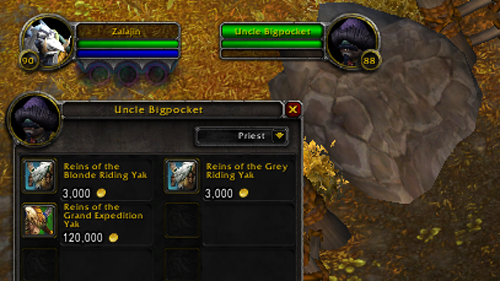 They are raising the price of the Grand Expedition Yak to 108,000 gold (with bartering guild perk, otherwise it’s 120K) instead of 60,000 gold. That means I have a lot more work to do for my Yak Fund. I’m around 80K gold right now so 28K to go! OK, which faction do I need for a discount? I figured they’d do that since 60K gold is pretty easy to get these days, plus they made the mount account wide so it’s less of a gold sink. They pretty much HAD to raise the price. Which brings up a question. 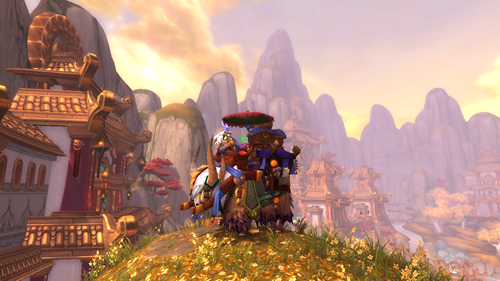 Do you think it’ll be easier or more difficult to make gold in MoP? I know that it’s going to change things. Transmutes require a Spirit of Harmony which is Bind on Pickup. So we’re going to have to actively play our crafters in order to make sell-able items. If this remains the case we should be transmuting about one gem per day based on the drop rate that I’ve been seeing doing dailies. Instead of buying a stack of herbs and transmuting as much as I can. Note: Our beta guild doesn’t have the Bartering perk yet. That’s why I don’t get the discount in the screen shot. On the live server we do have it.